This LO was for the monthly Scrap your Stash call over at SNR. 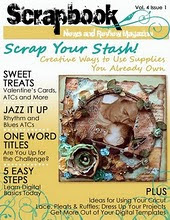 Each month an item is chosen for readers to use out of their stash. March's item was rub-ons. I had originally planned to try and do something unique and interesting with them but then when I looked through my meager stash I realised I didn't have any that would work for what I had in mind so I just went with a standard rub-on title.......boring, I know!! I also used the Jan Swirlydoos kit for this LO. The yellows and green of the pp's were perfect for this picture I had of my DD. She was dressed as a bumble bee for a party she was going to. I picked up the red from the berries of the plant she is standing next to to add the lovely red petaloo blooms that came with the kit. The gold and green Prima blooms were from my stash. I was so glad I finally had a LO to use them on. As a finishing touch, I fussy cut a bird from one of the pp's and outlined it with some crystal stickles. Every LO needs a little bling after all...LOL. I must just say that Krissy really challenged me with this kit because these colours are soooo out of my comfort zone. But it was nice to work with pp's that I would never have conidered buying if they weren't in the kit. It's always good for ones creative spirit to try something out of the norm once in a while.